Colorectal cancer is the second leading cause of death from cancer in North America and is often diagnosed at an advanced stage, after it has spread to other parts of the body. Patients with advanced colorectal cancer generally have a life expectancy of around 24 to 30 months. 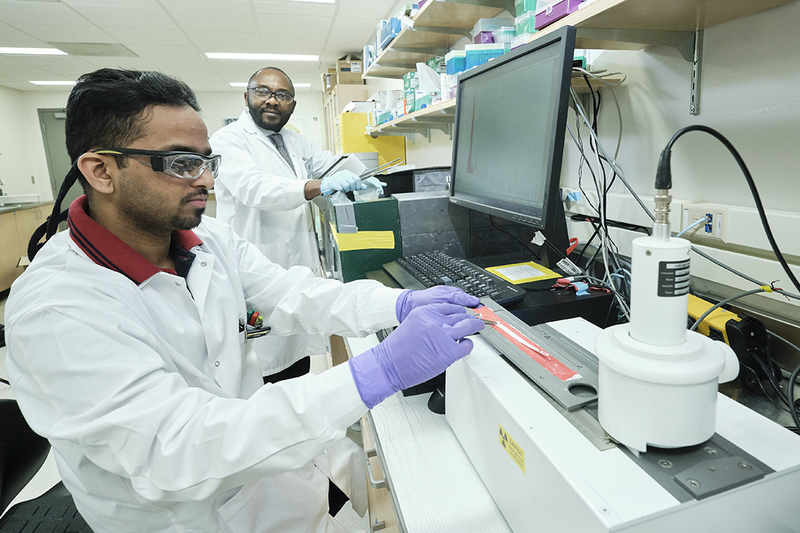 A USask team of researchers led by Humphrey Fonge, an assistant professor in the College of Medicine’s medical imaging department, has created an assassin antibody with attached radioactive molecules which cling to colorectal cancer cells and destroy them. The assassin antibody attaches itself to a specific protein which appears on colorectal cancer cells, and then kills it. The five-year research program has been awarded $872,100 by the Canadian Institutes of Health Research (CIHR)—one of five USask health research programs awarded a total of $4.9 million by the CIHR in its fall 2018 funding competition. Fonge said that the evaluation of the antibody in mice has been very promising and he hopes to move to human trials in two years. “We are very encouraged by our initial results in mice,” he said. The assassin antibody kills the colorectal cancer cell by releasing high energy to the DNA of the cell. Current antibody drug therapies can slow down the spread of colorectal cancer, but do not destroy the existing cancer cells. The USask research team, which includes post-doctoral trainee Behlol Khan, is planning to study whether the assassin antibody could be used to treat other cancers, including breast and pancreatic cancers, which express the same protein. Colorectal cancer patients are often diagnosed when the cancer is advanced and has spread, relying on scans to determine whether tumours have grown or have slowed down following treatment. The protein found in colorectal cancer cells makes the cells spread in an uncontrolled manner. They can double in number every few hours, leading to the rapid spread of this type of cancer. The USask team is developing another antibody which will allow doctors to specifically track the spread of colorectal cancer cells and the growth of tumours, enabling earlier diagnosis and targeted personal treatment. To speed diagnosis, this antibody will attach itself to colorectal cancer cells, allowing them to be identified and monitored for spread. But unlike the assassin antibody, it will not destroy the cancer. The research team uses the university’s Saskatchewan Centre for Cyclotron Sciences, which is managed by the Fedoruk Centre at USask.